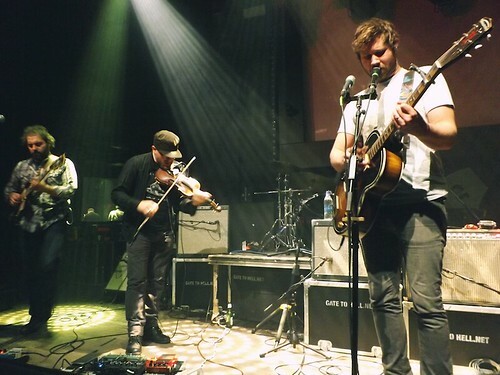 Dan Mangan has returned to Brighton once again this year to perform the last show of his UK tour. Back in April, the indie-folk singer from Vancouver played a sold out show at The Hope and this time around, he’s brought his music back to yet another great Brighton venue – The Haunt. To experience the sound of live music in its whole beauty, The Haunt is the right type of venue for an intimate show like this. It’s a place with a great atmosphere and special character. There isn’t a better way to spend this beautiful and cold evening, than to gather around some friendly bunch of people and warm up to some good live music. As the small crowd awaits the start of the show; soon a tall, well dressed guy appears, casually walking on stage with nothing but his guitar. 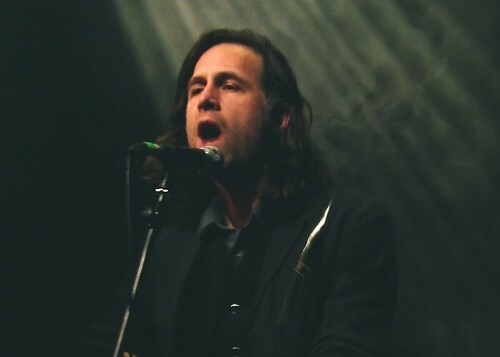 It’s Jason Collett – Toronto’s charismatic singer/songwriter, who draws you into the sound of his acoustic guitar and voice instantly. His songs are memorable and filled with sharp melodies. The track I Wanna Rob a Bank has a great catchy beat to it, as well as his final track of the set - I’ll Bring the Sun, for which he invites on stage the main act of the night - Dan Mangan, who comes on together with his band. The sound is taken to another level, as they all play and sing along with Jason. At this point, the audience is pretty warmed up and ready for the next round. After a short break, the crowd welcomes Dan and his band back on stage, kicking off the set with We Want To Be Pleasantly Surprised, Not Expectedly Let Down, which is the A-side taken from Dan’s latest single Radicals. It’s the perfect opening song with its grand intro as the drums, bass and guitar collide. Dan’s voice sounds beautifully haunting as he sings, with the lyrics sinking into our minds. About As Helpful As You Can Be Without Being Any Help At All is filled with impressive violin pieces from Jesse Zubot, who wows the audience while he fiddles away on his instrument. Dan approaches the crowd between the songs with a friendly manner; telling interesting tales, which are mostly about his songs and their meanings. His sense of humour puts a smile on our faces and makes us appreciate him more for his down to earth personality. Most of the songs he plays come from his two latest records - Oh Fortune and Nice, Nice, Very Nice. With Sold, we tap our feet and clap along the joyous rhythm while Leaves, Trees, Forest and If I am Dead remind us of the true beauty of folk music with its colourful melodies and meaningful lyrics. Dan’s excellent song writing is captivating and concentrates on things that truly matter in life. After a beautiful and memorable acoustic performance of Basket, Dan starts to explain an inspiring story behind the upcoming song - Starts With Them, Ends With Us; telling us about the two weeks he spent in Guatemala right after they finished a 30 year civil war. Hearing the stories of people affected by the war made him realize how easy life is back home. The song is about trust and what happens when it breaks, and about the society and the war. Next song - Road Regrets is on the other hand about the early days of musicians, who find themselves in countless situations with no money and playing to empty venues, though they still have the will to go on without giving up. There is a strong musicianship going on between Dan and his band - Gord Grdina (guitar), Kenton Loewen (drums), John Walsh (bass) and Jesse Zubot (violin), and it mirrors in the glorious sound that comes out with each song. It’s always a special feeling to get drawn into the music at any live show, but it’s even more special when the artist himself makes the audience a real part of his own performance. Dan invites us to join him in his next song - Robots and as he guides us through the ending lyrics of the track, we repeatedly sing out loud the catchy lines: ‘Robots need love too; they want to be loved by you’. It sounds like there are some pretty good voices in the room as we seem to be in harmony; even Dan says we sound great. Slowly, we head towards the end of this amazing show and we get to hear the heartbreakingly beautiful Jeopardy and someone even requests The Indie Queens Are Waiting, which lucky for us, he manages to squeeze it in. For the finale, Dan steps down to the crowd and we all gather around in the circle and we accompany him once again, as he stands in the middle and sings out So Much For Everyone. It’s a very intimate and fulfilling moment that doesn’t happen often, and everyone who experiences it knows, that there is nothing quite like it. It is not just about the artist on stage or the audience down below, but about making a special memory together, being equal with one another and enjoy everything good about music and the joy it brings. 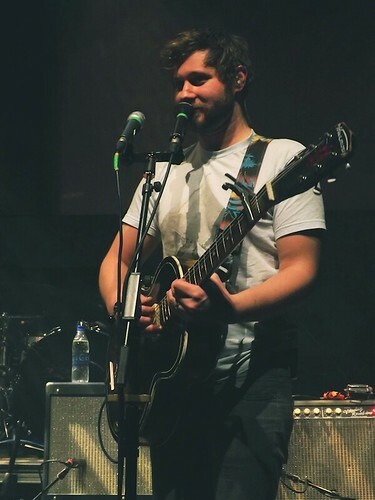 Dan Mangan has given us one of the most unique live experiences and nobody has left The Haunt tonight without a smile on their face.